WHY do you want to BUILD a quality list? There are 2 main keys to your success in building your list. First, you need to constantly add fresh, new, targeted prospects who have the ability to write you a check and who you want to do business with. And second, you need to constantly nurture your relationship with that list so they are highly responsive. Truth #1: The more clear and specific you are about WHO you’re trying to attract, the more successful you’ll be at building a hyper-responsive list (think “niche”). You CAN have multiple niches; just start with ONE. You don’t have to pick specific industries as long as you notice distinct commonalities that your prospects share. 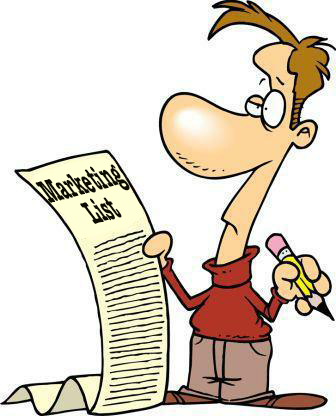 Truth #2: “Great lists are built, not bought.” Buying a list is the lazy IT business owners way to (very likely) spend a lot of money on marketing and get frustrated with the lack of results. Be smart… build your list! Truth #4: A big list is not always a good thing. Get in the mindset of quality PLUS quantity. Quality should be the number one objective. Truth #5: The value of a list is in the relationship, not the size, demographics, etc. Be a list Nazi. Everyone you meet who could be a good potential client, JV partner or key contact should go into your CRM with complete and accurate information. Become great at referrals and networking. Constantly ask your clients “Who do you know…?” Have a referral system in place. Get involved in your community. And when you meet someone, see #1 above… get them on your list. Use website opt-in forms throughout your website to capture prospect information. Use them to capture both hot prospects and warm or interested prospects not ready to buy right now. Multiple Entry Points. Make sure that you are offering a variety of different topics and/or services to attract buyers with different needs key to your business. Telemarketing. Use a telemarketing script to clean and qualify a cold list, purchased list, online directory, etc. Seminars and Webinars are good list-building tools, particularly if you pick a good, relevant topic and market them based on Robin’s methods. It’s great to find interested buyers in bunches instead of one by one. Joint Ventures can be a great way to build your list. You likely don’t even need to scrub a good JV list.